Cute Jewellery by Chelsea Doll: It's All About the Chintz! It's All About the Chintz! What does Chintz say to you? Wallpaper? China? Something that wouldn't look out of place in your Gran's house? Well now, for us, it screams uber cool jewellery! 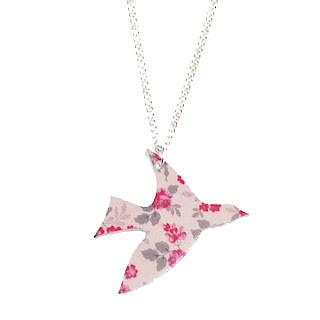 Just landed at Chelsea Doll, are these wonderful Chintz patterned bird necklaces. 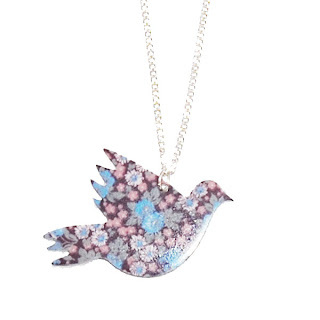 Priced at £8, there's a choice of the Blue Chintz Bird Necklace or the Pink Chintz Bird Necklace. Both equally as pretty as the other, in fact we'd be tempted to buy the both! So pretty yet so unusual. 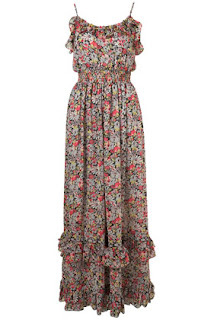 We've actually had a bit of a Chintz floral-fest over the last couple of days and found this lovely Eden Print Maxi Dress from Topshop. You can never have too many Winter florals!